Seven times a day someone in this country dies in a fire. The Red Cross Home Fire Campaign aims to reduce deaths and injuries from home fires by as much as 25 percent over the next few years. 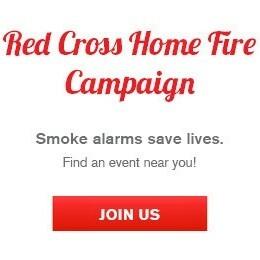 The Red Cross and thousands of campaign partners have helped save numerous lives and installed more than a quarter of a million smoke alarms in homes all across the country since the campaign launched in October of 2014. The Red Cross of Coachella Valley/Morongo Basin partners with fire departments and community groups across the country to install free smoke alarms in communities with high numbers of fires and encourage everyone to practice their fire escape plans. Joining the Red Cross here will be the City of Coachella, CAL FIRE, Red Cross, Sheriff Explorers group #805, AmeriCorps-Lectura, Boys and Girls Club, and Desert Recreation District. We are looking for volunteers and there is no experience necessary! If you would like to volunteer, please sign up at http://tinyurl.com/HomeFireJan14-2017. For more information, please contact Michelle Aleman at michelle.aleman@redcross.org or 888-831-0031 ext.3004. Next The Home Fire Campaign is coming to Ontario!